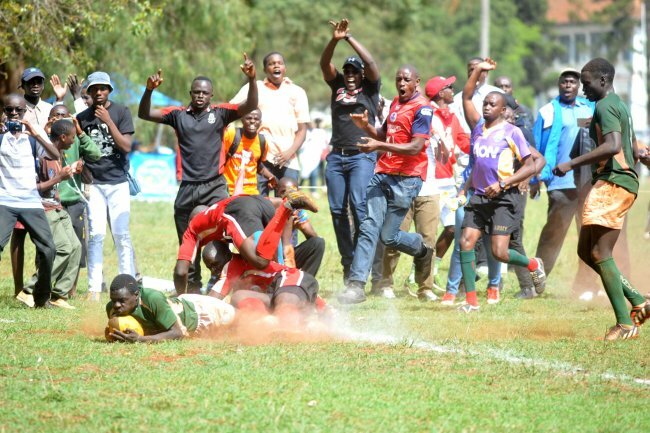 Former national champions Kakamega High and Laiser Hill qualified for the rugby final of this year's Kenya Secondary Schools Sports Association National Term One games at Nairobi School on Friday morning. The six-time champions, Kakamega, will be seeking to reclaim the title that has eluded them since 2013. They beat a resilient Upper Hill 5-0 in the first semi final. Immediate former champions Laiser Hill booked a place in Saturday's final after comfortably beating 2014 winners St Mary's Yala 34-16. The final will be a repeat of the preliminary encounter between the two sides where Laiser Hill snatched a narrow 10-8 win. Timothy Onella was the star of the day for Kakamega High with the winning try early in the second half. In the second semi final, Laiser captain Joel Inzuga led from the front with two tries with Gregory Simiyu also touching down. Johnstone Olindi and Billy Kipchirchir were also able to get their names on the tries list. St. Mary's Yala replied with tries by Michael Onyango and Ronny Willy. They added a penalty each. Laiser Hill coach Kevin Wambua was worried that Kakamega High could be fired up to avenge the loss at the pool stage. "I expect a tough and tactical approach from Kakamega. Even though we won the preliminary match, my boys should be careful of any laxity because they will be coming for a revenge," Wambua said. His Kakamega counterpart Amos Wamanga said that despite reaching the final, they will only consider themselves successful after winning the tie. "This is the real deal and we will only count this competition a success if we win the final. Stakes are high and we are up to the task," he said. In girls hockey, St. Cecilia Girls Misikhu revenged on their last year’s semi finals loss to Sinyolo Girls to book a place in the final where they will play St. Joseph Kitale. Misikhu beat Sinyolo 2-1 on shootouts after the two sides had tied 1-1 in the normal time while St.Josephs sailed into the final with a 1-0 win over Moi Girls Nairobi at State House Girls ground. Stephanie Rebecca gave Sinyolo the lead with a minute to the break. However the lead lasted only seconds as Misikhu leveled seconds to the halftime buzzer through Agnes Mochama from a short corner. The second half saw the two teams waste many scoring opportunities. With no goal in the second half, the winner was decided on shootouts where Misikhu carried the day. Eleanor Chebet and Mochama converted two shutouts for Misikhu with only Lydia Adhiambo replying for Sinyolo. In the other semi final tie, St. Joseph Kitale hanged on to their second minute lead through Agnetta Okumu to once again end Moi Nairobi Girls hopes of qualifying for the final. In the boys hockey action, St. Anthony's Boys overran Kisumu Day 5-0 to qualify for the final where they face Upper Hill who beat Dr.Ribeiro 2-0. Brian Ogenche scored a brace as St.Antony’s had a walk in the park against the Nyanza representative. Ogenche opened the scores in the 13th minute before Basil Wamalwa made it 2-0 three minute later. The Rift Valley representatives went to the break 3-0 up after Wycliffe Simiyu scored a third goal two minutes to the break. Ogeche added on his second with a penalty corner with eight minutes to the end of the match before Quack Kadius made it 5-0 a minute to the end of the match. Morrison Mburu and David Mwaura were on target with two first half goals as Upper Hill edged Dr. Ribeiro.